Sheep are supplementary fed for either survival or production purposes. Efficient supplementary feeding should aim to supply sheep with a diet that is sufficient in digestible energy and protein. We recommend testing feedstuffs, although the feed tables supplied here can be used to help roughly estimate the amount of grain and fodder required. Knowing the value of different feedstuffs is critical when making decisions about livestock nutrition, for survival, maintenance and growth. 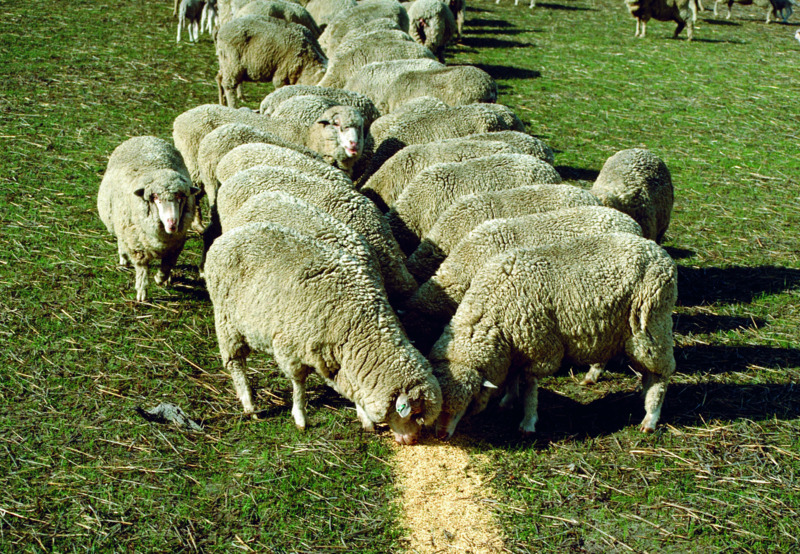 Supplementary feeding is a key part of a Western Australian (WA) sheep enterprise because most sheep systems are on annual pasture which is dry over the Mediterranean summer. Feed shortage over late summer and autumn are common. We recommend that you test grain and fodder for nutrient content before formulating supplementary feeds. Testing is desirable because grains, hay and silage vary a lot in dry matter percentage and nutrient content between years and sources. If you choose not to have the feed tested, the tables below will give general estimates of the dry matter percentage and nutritional value of different feeds. We recommend that you consult a livestock adviser or veterinarian for any extended period of suppplementary feeding. Typical dry matter (DM) values are shown in each table below. The moisture content of feeds as fed can vary greatly: converting weights of feed components to DM when formulating feeds removes one of the common reasons for variation in the composition of feedstuffs. To convert energy, protein and fibre content values in Tables 1, 2 and 3 to an 'as fed' value, multiply the decimal equivalent of the DM content by the compositional value shown in each table. For instance, in Table 1 for wheat, the average metabolisable energy is 0.91 x 12.9MJ/kgDM = 11.74MJ/kgDM (megajoules per kilogram of dry matter). Metabolisable energy (ME) is the energy value of a feed available for an animal's maintenance or growth, and can be expressed in megajoules per kilogram of dry matter (MJ/kgDM). ME is calculated from feed digestibility and estimates the total energy available to the animal. Crude protein (CP) values are shown in each table for each feed. The protein in a feed is estimated from the measured nitrogen (N) content of that feed. The estimate is termed crude protein, and is expressed as a percentage. The value of 6.25 is based on all proteins having about 16% N: therefore, to convert N to CP, multiply N by 100/16 or 6.25. This measure includes any non-protein nitrogen components, such as urea. In simple terms, the higher the fibre content, the lower the digestibility and the amount that an animal can eat in any one day. Crude fibre is the fat-free organic substances in feedstuffs which are insoluble in acid and alkaline media. It is a measure of the quantity of indigestible cellulose, pentosans, lignin, and other components of this type present in foods. These components have little food value, but provide the bulk necessary for proper peristaltic action in the intestinal tract. Acid detergent fibre (ADF) refers to the cell wall portions of the forage that are made up of cellulose and lignin. Lignin is indigestible fibre. As lignin increases, digestibility, intake, and animal performance usually decrease and the percentage of ADF and neutral detergent fibre (NDF) increase. ADF values relate to the ability of an animal to digest the forage. As ADF increases, digestibility of forage usually decreases. The NDF value is the total cell wall, which is comprised of the ADF fraction plus hemicellulose. Cellulose and hemicellulose is partially digested in the rumen while lignin is indigestible fibre. NDF values reflect the amount of forage the animal can consume. As NDF percentage increases, animals will generally eat less because of the rising fibre content, which takes longer to digest in the rumen. Most of these values have been extracted from data collected by Independent Lab Services, Perth, Western Australia, as reported in Bulletin 4473 'The good food guide for sheep'), with some values from other Australian departments (marked with *). Table 1 Dry matter, energy, protein and fibre content (dry matter basis) of cereals and pulses commonly fed to sheep. The average across the range of values tested in WA is shown in brackets. Table 2 Dry matter, energy, protein and fibre content (dry matter basis) of cereal seconds commonly fed to sheep. The average across the range of values tested in WA is shown in brackets. Table 3 Dry matter, energy, protein and fibre content (dry matter basis) of hays and straw commonly fed to sheep. The average across the range of values tested in WA is shown in brackets.